This is one of those questions that seems like a no-brainer -- a bunch of people are sharing a ride, so they must be saving energy. When asked this question, we all think of a full bus or train of people vs. the number of cars that would have carried the same people. The key issue turns out to be occupancy -- how full is the train or bus. And it turns out that occupancy is probably lower than most people think. That is because everyone rides on buses or trains as they commute -- they are going in the direction of most people's travel at the time of day they travel, so the transit is totally full. But no one thinks about those trains having to go back the other direction, usually mostly empty. As a result, we get to this fact, from the National Transit Database as synthesized by Randal O'Toole. Valley Metro Rail here in Phoenix does better, at a reported 1885 BTU per passenger mile. As reported many times here on this site, the cost of building this rail line, now well over one and a half billion dollars, would easily have bought every round trip rider a new Prius, with a lot of money left over. This would have saved more energy as well. Buses in Phoenix are averaging just over 6000 BTU per passenger mile. It turns out that the US is one of the few industrialized nations to meet the terms of the Kyoto protocols (reduce CO2 emissions to 1997 levels) despite the fact we never signed it or did anything to try to meet the goals. Thank the recession and probably more importantly the natural gas and fracking revolution. Fracking will do more to reduce CO2 than the entire sum of government and renewable energy projects (since a BTU from natural gas produces about half the CO2 as a BTU form coal). Of course, environmentalists oppose fracking. They would rather carpet the desert with taxpayer-funded solar panels and windmills than allow the private sector to solve the problem using 50-year-old technology. Frequent readers of this blog will know that I am enormously skeptical of most fuel and efficiency numbers for electric vehicles. Electric vehicles can be quite efficient, and I personally really enjoy the driving feel of an electric car, but most of the numbers published for them, including by the government, are garbage. I have previously written a series of articles challenging the EPA's MPGe methodology for electric cars. The implication, then, is that electric vehicles are 3x more energy efficient than cars with gasoline engines. I hope engineers and scientists can see immediately why this statement is total crap, but for the rest, here is the problem in short: Electricity has to be produced, often from a fossil fuel. That step, of converting the potential energy in the fuel to use-able work, is the least efficient step of the entire fuel to work process. Even in the most modern of plants it runs less than a 50% conversion efficiency. So the numbers for the gasoline cars include this inefficient step, but for the electric vehicle it has been shuffled off stage, back to the power plant which is left out of the calculation. Factor in the $200 a month he reckons he isn't paying for gasoline to fill up his hulking SUV, and Mr. Beisel says "suddenly the [Nissan Leaf] puts $2,000 in my pocket." Yes, he pays for electricity to charge the Leaf's 24-kilowatt-hour battery—but not much. "In March, I spent $14.94 to charge the car" and a bit less than that in April, he says. This implies that on a cost-per-mile basis, the EV is over 13x more efficient than gasoline cars. Is this a fair comparison? For those who do not want to read a lot of math, I will preview the answer: the difference in fuel cost per mile is at best 2x, and is driven not by using less fossil fuel (the electric car likely uses a bit more, when you go all the way back to the power plant) but achieves its savings by using lower cost, less-refined fossil fuels (e.g. natural gas in a large power plant instead of gasoline in a car). Let's start with his estimate of $14.94. Assuming that is the purchased power into his vehicle charger, that the charger efficiency is 90%, and the cost per KwH in Atlanta is around $0.11, this implies that 122.24 use-able KwH are going into the car. Using an estimate of 3.3 miles per KwH for the Leaf, we get 403 miles driven per month or 3.7 cents per mile in electricity costs. This is very good, and nothing I write should imply that the Leaf is not an efficient vehicle. But its efficiency advantage is over-hyped. Now let's take his $200 a month for his Ford Expedition, which has an MPG around 15. Based on fuel prices in Atlanta of $3.50 a gallon, this implies 57 gallons per month and 857 miles driven. The cost is 23.3 cents per mile. Already we see one difference -- the miles driven assumptions are different. Either he, like a lot of people, don't have a reliable memory for how much he spent on gas, or he has changed his driving habits with the electric car (not unlikely given the shorter range). Either way, the total dollar costs he quotes are apples and oranges. The better comparison is 23.3 cents per mile for the Expedition vs. 3.7 cents a mile for the Leaf, a difference of about 6x. Still substantial, but already less than half the 13x difference implied by the article. But we can go further, because in a Nissan Leaf, he has a very different car from the Ford Expedition. It is much smaller, can carry fewer passengers and less cargo, cannot tow anything, and has only 25% of the Expedition's range. With an electric motor, it offers a very different driving experience. A better comparison would be to a Toyota Prius, the c version of which gets 50MPG. It is similar in most of these categories except that it has a much longer range, but we can't fix that comparison, so just keep that difference in mind. Let's look at the Prius for the same distances we calculated with his Leaf, about 403 miles. That would require 8.1 gallons in a Prius at $3.50, which would be $28.20 in total or 7 cents a mile. Note that while the Leaf still is better, the difference has been reduced to just under 2x. Perhaps more importantly, the annual fuel savings has been reduced from over $2200 vs. the Expedition that drove twice as many miles to $159 a year vs. the Prius driving the same number of miles. So the tradeoff is $159 a year savings but with much limited range (forgetting for a moment all the government crony-candy that comes with the electric car). $159 is likely a real savings but could be swamped by differences in long-term operating costs. The Prius has a gasoline engine to maintain which the Leaf does not, though Toyota has gotten those things pretty reliable. On the other hand the Leaf has a far larger battery pack than the Prius, and there are real concerns that this pack (which costs about $15,000 to manufacture) may have to be replaced long before the rest of the car is at end of life. Replacing a full battery pack after even 10 years would add about $1200 (based on discounted values at 8%) a year to operating costs, swamping the fuel cost advantage. Also note that a 2x difference in fuel costs per mile does not imply a 2x difference in fuel efficiency. Gasoline is very expensive vs. other fuels on a cost per BTU basis, due to taxes that are especially high for gasoline, blending requirements, refining intensity, etc.) Gasoline, as one person once said to me way back when I worked at a refinery, is the Filet Mignon of the barrel of oil -- if you can find a car that will feed on rump steak instead, you will save a lot of money even if it eats the same amount of meat. A lot of marginal electric production (and it is the margin we care about for new loads like electric cars) is natural gas, which is perhaps a third (or less) the cost of gasoline per BTU. My guess is that the key driver of this 2x cost per mile difference is not using less fuel per se, but the ability to use a less expensive, less-refined fuel. Taking a different approach to the same problem, based on the wells-to-wheels methodology described in my Forbes article (which in turn was taken directly from the DOE), the Nissan Leaf has a real eMPG of about 42 (36.5% of the published 115), less than the Prius's at 50. This confirms the findings above, that for fossil fuel generated electricity, the Leaf uses a bit more fossil fuels than the Prius but likely uses much less expensive fuels, so is cheaper to drive. If the marginal electrical fuel is natural gas, the Leaf also likely generates a bit less CO2. Folks who read this site know I have been critical of Phoenix light rail since well before it was opened. So often, folks just willfully misinterpret my criticisms. The actual rail line and its service is pretty nice, and the facilities are quite attractive (lets see what they look like in 10 years though). If Santa Claus had just delivered the Phoenix light rail system for free to Phoenix, I would be thrilled with it. But Santa unfortunately was not involved, and instead the rail line was paid for by area residents, and it cost them over $75,000 per daily roundtrip rider to build, plus annual operating deficits infinitely into the future. I would be thrilled if an Aston Martin Vanquish showed up in my garage tomorrow, but I am not going to fork over a quarter of a million bucks for one. Ditto the light rail system. Anyway, the 2009 FTA transit database is out, and Randal O'Toole has helpfully summarized it in spreadsheet form, which you can download here. You can peruse your own local system. Probably the hardest thing to figure out are the mode codes, which are deciphered here. Since 2009 was the first full year of operation for Phoenix light rail, we can finally look at data for Phoenix on an apples to oranges apples basis with other transit systems (it is really, really hard to squeeze useful information out of the data Valley Metro posts on their site). I am just going to highlight two numbers for Phoenix light rail (TRS_ID 9209 in the data). The public subsidy per individual trip (that is one person boarding and riding one way) is $32.73!! No one would pay this amount if it were the fare. This equates to a public subsidy (beyond the fares paid) of $3.82 per passenger mile. Remember, this is not a hostile analysis, but based on the numbers Valley Metro itself submits to the FTA. Note the IRS reimbursement rate for the total cost (capital and incremental expense) of driving a car is 50 cents per mile, which drops even lower per passenger mile when the car has more than one person in it. The average occupancy of a car is something like 1.5, which would make the cost per passenger mile of the average car to be about 33 cents per mile. Ignoring the passenger fares, the public subsidy alone for light rail in Phoenix is 11.6 times larger [note: and yes, this includes the gas tax, so it includes a lot of the maintenance of the road infrastructure. To include full cost of maintaining and building highways, it might have to be a few cents higher, but its not going to come anywhere in the ballpark of the light rail number]. But we are paying more for rail to save the environment, right? Well, the BTUs expended per passenger mile for Phoenix light rail was 4402. This compares to the average for passenger cars as determined by the DOE at 3437 BTU/PM. So the train actually uses 28% more energy to move one rider one mile than does the average car. Years before the light rail system was completed, I made my light rail bet: That with the capital cost, I could easily buy a Prius for every daily rider, and still save money. And for less than the annual operating subsidy, I could give all the new Prius owners free gas each year. Already my bet has proved more than correct. But now we know that under my Prius plan, we also would have saved energy, since the Prius uses less than 1700 BTU/pm, less than a third of what Phoenix light rail consumes. Update: True MPGe is closer to 36, see below. The 36 actually comes from the government's own research and rule-making, which they have chosen to ignore. Problem #1: Greenhouse gas estimate is a total crock. Zero? The Greenhouse gas rating, in the bottom right corner, is that the car produces ZERO greenhouse gasses. While I suppose this is technically true, it is wildly misleading. In almost every case, the production of the electricity to charge the car does create greenhouse gasses. One might argue the answer is zero in the Pacific Northwest where most power is hydro, but even in heavy hydro/nuclear areas, the incremental marginal demand is typically picked up by natural gas turbines. And in the Midwest, the Leaf will basically be coal powered, and studies have shown it to create potentially more CO2 than burning gasoline. I understand that this metric is hard, because it depends on where you are and even what time of day you charge the car, but the EPA in all this complexity chose to use the one number - zero - that is least likely to be the correct answer. Problems #2: Apples and oranges comparison of electricity and gasoline. To get 33.7 kWhs to one gallon, they have basically done a conversion through BTUs -- ie 1 KWh = 3412 BTU and one gallon of gasoline releases 115,000 BTU of energy in combustion. Am I the only one that sees the problem? They are comparing apples and oranges. The gasoline number is a potential energy number -- which given inefficiencies (not to mention the second law of thermodynamics) we can never fully capture as useful work out of the fuel. They are measuring the potential energy in the gasoline before we start to try to convert it to a useful form. However, with electricity, they are measuring the energy after we have already done much of this conversion and suffered most of the losses. They are therefore giving the electric vehicle a huge break. When we measure mpg on a traditional car, the efficiency takes a hit due to conversion efficiencies and heat losses in combustion. The same thing happens when we generate electricity, but the electric car in this measurement is not being saddled with these losses while the traditional car does have to bear these costs. Measuring how efficient the Leaf is at using electricity from an electric outlet is roughly equivalent to measuring how efficient my car is at using the energy in the drive shaft. 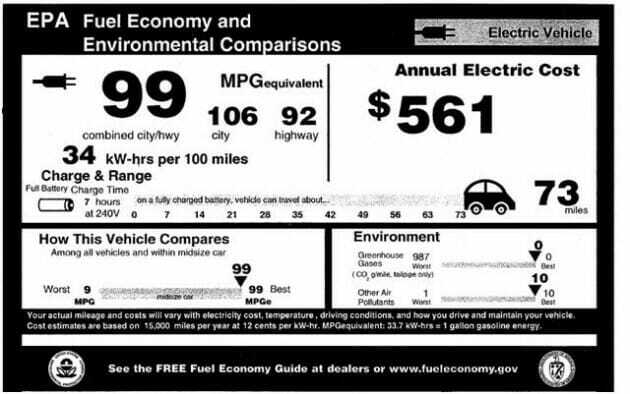 An apples to apples comparison would compare the traditional car's MPG with the Leaf's miles per gallon of gasoline (or gasoline equivalent) that would have to be burned to generate the electricity it uses. Even if a power plant were operating at 50% efficiency (which I think is actually high and ignores transmission losses) this reduces the Leaf's MPG down to 50, which is good but in line with several very efficient traditional cars. Update: I have new numbers, which in part help respond to the first commenter. The short answer to his comment is that there is a big difference between handwaving away10% you missed and handwaving away 70%. I agree that the EPA numbers for the Leaf are valid "tank-to-wheel" numbers (meaning how efficiently does the car use the energy in its tank). The question is, whether tank-to-wheel has any meaning at all. My article above is basically an argument for why it is not valid. Here is an extreme example -- what if we ran cars off of replaceable flywheels that were spun up by third parties and then put in our cars already energized. These would be highly efficient on a tank to wheel basis, as we just need to transmit what is already mechanical energy to the wheels. But does ignoring the energy costs and inefficiencies in spinning these things up offline really make sense? We can go to the government itself to solve this. In this rule-making document, the DOE defines some key numbers we need here. They define petroleum refining and distribution efficiency as .83, meaning it takes 1 gallon of gas out of the well to get .83 in your tank. For electricity, they define two numbers that must be multiplied together. The fossil fuel electrical generation efficiency is .328 and the transmission efficiency is .924, for a net of .303. Note the big freaking difference between .83 and .303, which is why to call it all handwaving is disingenuous. Sure, we often handwave away the fossil fuel cost of getting gas in our cars, but the fossil fuel cost of getting electricity in the batteries is four times higher. The government even does the math, multiplying the 33.7 Kwh/gal used above by .303 and dividing by .83 to get an apples to apples well to wheels mpge number for electric vehicles of 12.3 Kwh/gal. So a total apples to apples comparison factor already exists, and the government chose not to use it for the window stickers. This is probably because it would have given the Nissan Leaf an mpge of 36, not bad but fairly pedestrian for such an overhyped technology. And at some level the Leaf is irrelevant. This entire process has likely been tilted to make the Government Motors Volt look better. For years, my observation has been that the perfect has been the enemy of the good in energy policy. Now, I don't support the feds making energy policy at all, but given that they do, too often the government has ignored the 80/20 solution that would get most of the desired benefits for a fraction of the cost of alternatives being considered. For example, in California, the state could have made a ton more progress reducing vehicle emissions had they accepted a low emissions standard decades ago that allowed for things like compressed natural gas (CNG) as a vehicle fuel. However, environmentalists insisted on zero emissions, and thus only electric vehicles passed muster, and the technology simply has not been there (not to mention that at the margin, new electric vehicles in the state would at best be powered by natural gas and at worst by Arizona and Nevada coal plants, making the very concept of "zero-emissions" crazy). Looking at this, and given the huge amounts of natural gas in this country, one might reasonably expect that a logical policy suggestion would be to try to provide incentives to substitute natural gas for coal and diesel fuel. The technology exists right now, today, to produce electricity with gas and to power large vehicles with CNG (and focusing on truck fleets eases the distribution issues with CNG). But of course absolutely no one in the global warming movement is suggesting this (except for T. Boone Pickens, and he is involved in climate bills as a rent-seeker, not as an advocate). You see, we want "renewable" energy, and natural gas does not fit. Though for some reason ethanol does, despite the fact that ethanol probably creates more CO2 than it reduces. No point here really, since I am not advocating any sort of energy policy. But it reinforced to me why no one should claim as a justification for energy policy that somehow the system will be more efficient if a few smart people design it top-down, when one of the most obvious 80/20 solutions to Co2 reduction is not even considered. A month or two back, I was participating in the California Regional Council of Rural Counties annual meeting. At this conference, I was there to have a sort of informal debate on climate change with Joe Nation, a former California State legislator and currently a private consultant on climate issues. To some extent my role was frustrating for the audience, because they were already stuck with complying with California's AB32 (a sort of state CO2 cap and trade system) and arguing that such legislation was pointless only served to upset them (my presentation, both in powerpoint and video is here). By the way, we often lump "government" together, but I can tell you that while the governor and the legislature of California may be 100% behind CO2 alarmism, the county commissioners were very sympathetic to the skeptic position. Anyway, towards the end of my presentation I made a plea for a carbon tax over cap-and-trade, and said in fact that California's AB32 was living proof of my argument. The California Air Resources Board (CARB), which is tasked with implementing the plan, has already added hundreds of people to its staff and worked for over two years, is still no where near finished with rule-making. The complexity, and the battling political constituencies, is simply mind-boggling. It is already clear that the result is going to be a Byzantine, Rube Goldberg structure of detailed industry-specific reporting and permitting rules. Nearly 100% of CARB's time is taken up today with various groups running to them begging for some sort of special treatment (think "carbon bailout" and you will get the idea). No one thinks the process is fair or rational. Under cap-and-trade, every single industry will report greenhouse gasses, have industry and firm-specific limits, myriads of permits, etc. For example, we had detailed discussions that day of how cattle flatulence will be treated and measured. The alternative is a carbon tax, which is dead simple. There is one single rate to set - the tax per weight of carbon in fuel. Fuels with more carbon per BTU, like coal, thereby get higher taxes. The system works like a sales tax, and could be administered by the BOE (who runs the California sales tax system) in its sleep. The cap-and-trade system is far more expensive than a carbon tax. By the basic laws of supply and demand, both systems have to raise the cost of burning certain fuels by about the same amount to get about the same reduction in use. But the cap-and-trade system brings a huge overhead burden, both in government bureaucracy as well as compliance costs, that make it far, far more expensive for the same amount of benefit. Until he started sitting on the boards of companies who depend on these inefficiencies in the cap and trade system to make money, Al Gore advocated a straight carbon tax over cap-and-trade. Private implementation and compliance costs are meaningless to legislators. There is no public measurement or accountability for these costs, and most of these costs fall on businesses, who can be ignored as unsympathetic in political discourse. I operate in Mono County, California, and they put out a new set of reporting requirements driven, they said, by the needs to save a few hours a year of their auditors' time. But compliance with these new rules costs our company 10-20 hours, at least, a year. And we are just one of many, many companies reporting. I complained that it was crazy for them to ask taxpayers to spend hundreds of hours of labor to save them just a few, but they could not have cared less. For legislators, particularly in California, creating large new bureaucracies is good. It creates a patronage relationship between the legislators and these new government employees that is almost quasi-feudal. Public employees are an enormous source of support for incumbent politicians, and these bureaucracies also offer future employment opportunities for legislators once they leave office (nice article here). First, last, and always, the vast majority of politicians are gutless. That means if they can pass the same tax in a way that is more hidden (ie cap-and-trade vs. carbon tax) they will prefer this approach, even if it means the tax is substantially less efficient. In the case of cap-and-trade, since costs are hidden and spread around like peanut butter rather than easily identifiable, they can pretend the costs don't exist and, if someone starts worrying about rising electricity costs that result, simply blame the rising costs on the evil power/oil/coal/etc companies. Obama has brilliantly taken this one step further, by outrageously claiming, in the broken windows fallacy of all time, that cap-and-trade will actually boost the economy through green job creation. A carbon tax gives politicians very little room to extract personal value from the electorate. Really, there is only one number for everyone to argue over. But cap-and-trade is a Disneyland for lobbyists. There can be special exemptions, industry specific caps, firm-specific caps, geography-specific caps. Once everyone sees the first few guys giving campaign donations and parading into CARB for special treatment, everyone feels like they have to in order to avoid being the one guy left out. My guess is that cap-and-trade will spawn more lobbying than any other legislation in US history. And politicians, no matter what their public stance, love lobbying, because everyone who comes to ask them for something knows there has to be a quid pro quo. Update: A number of related thoughts and posts here, at Reason. A week or so ago, I discussed federal energy subsidies and hypothesized, without a lot of facts, that a lot of them go to failing alternative energy projects rather than to oil company shareholders. I asked readers if they had any more information, and the discussion is here. power gets a lot more power for the buck than other "alternatives." energy-from-donkey-poop or for CEO salary enhancement. dining may be under threat from MEPs who want to ban the patio heater. could cost the pub and catering trade dear. By the way, something not mentioned in the article, perhaps because it takes a knowledge of actual science and stuff, is that these heaters tend to burn LPG and propane, which due to their molecular structure produce far less CO2 per BTU than other fossil fuels. Government cannot correct supposed market irrationalities because governments always act more irrational than private players in the market, no matter who is in charge. Most legislation supposedly to fight global warming is using global warming as a fig leaf to hide the actual reason for the legislation. My guess in this case is that the sponsors of this legislation have some other reason for wanting the ban, but dress it up as global warming. This mirrors the larger issues, there socialists, unrepentant Ehrlich admirers, and anti-globalization loonies have repackaged themselves as fighting global warming and then, surprise, proposed the same government actions they were pushing for pre-global-warming-hysteria.